The g-meter+ is designed for statutory annual MOT brake performance testing and is VOSA-approved for all classes of road-going vehicles (including class I & II). It is also suitable for statutory testing of HGVs. It is also TÜV-certified* as a brake-measuring instrument. The instrument is self-aligning and senses the direction of travel. It measures peak and mean acceleration, and stopping time, calculating the stopping distance. Deceleration can be measured in %g or in m s-2. 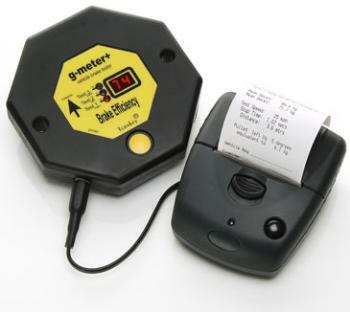 g-meter+ stores up to 3 sets of test results in its memory and comes with an optional printer for recording results.